Gerhart Hauptmann Schule at Regenbogenfabrik > Sudanese food, books, T-shirts! Heute werden wir täglich mehr denn je von Horrormeldung, von immer neuen Kriegen, Anschlägen, Umweltkatastrophen und toten Flüchtlingen schockiert. Die Einschläge der Bomben im Nahen Osten, in Afrika und Osteuropa hallen in unseren Köpfen und Herzen nach. Aber wir trauern nicht nur um unsere toten Schwestern, Brüdern, Familien und Mitmenschen, sondern wollen am 1. September 2015, dem Anti-Kriegstag, in Wuppertal ein deutliches Zeichen der Solidarität für eine friedliche Welt setzen. During our journey back to the borders we witnessed for two weeks the situation for new arrived refugees in Lesvos getting worse day by day. More and more children, mothers, fathers and grandparents are risking their lives by crossing the Aegean sea. After arriving and being thankful for surviving they are faced with the unbearable situation in Lesvos. Walking in the sun for 2 – 68 km, waiting in dirty parking lots, at the port, in makeshift refugee camps like Kara Tepe and outside and inside the Detention center of Moria and elsewhere. The Situation at other European arrival and transit points like Kos or Idomeni is not better. It is time for the competent authorities of the European Union to provide for Ferries transporting refugees to Europe in a respectful and save way. Freedom of Movement for everybody! Up to 50 refugees have been found dead in a truck in Austria, as German Chancellor Angela Merkel and Balkan leaders gathered in Vienna to decide on how to tackle together “the biggest migration crisis to hit Europe since World War II”. Read hole article on birdsofimmigrants. Afgelopen zondag (23 augustus) bezette vluchtelingencollectief We Are Here een voormalig kunstacademiegebouw aan de Dapperstraat in Amsterdam-Oost. Vanochtend is de groep door de eigenaar, de Amsterdamse Hogeschool voor de Kunsten (AHK), gevraagd het pand voor 1 september te verlaten. We Are Here is ten einde raad en weet nog niet welke vervolgstappen het zal nemen. De groep van 60 mannen kan nergens anders heen, zij zullen wederom op straat komen te staan. Verwaltungsparanoia und Zeltphobie des Bezirks verhindern fast das “Festival gegen Rassismus” auf dem Blücherplatz! Last night w2eu and JOG hosted a welcome party in the selforganized space PIKPA to welcome and exchange with the refugees staying there. Over the last three year this became a PIKPA – w2eu – JOG Tradition. 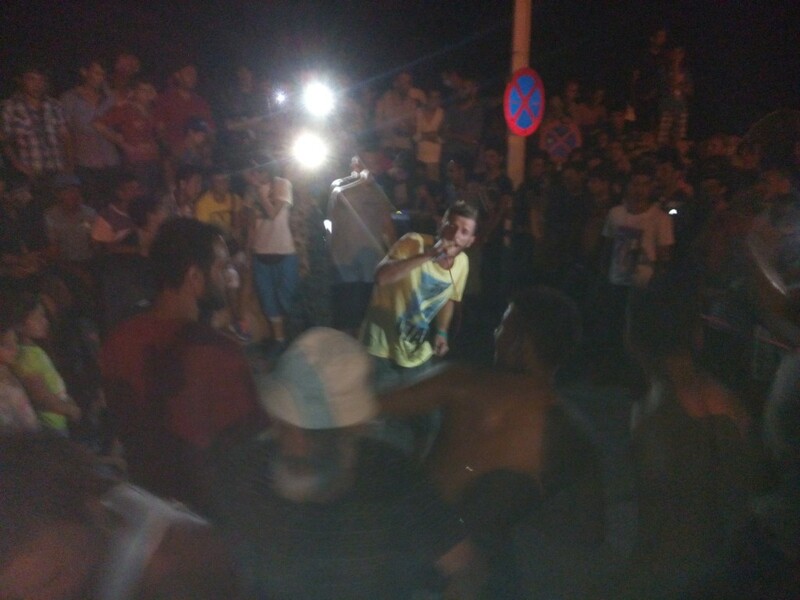 The musicians Leon, Leo and Max traveled from Berlin and Istanbul to be part of the JOURNEY BACK TO THE BORDER and managed again for everybody to forget their sorrows for a few hours by singing and dancing. 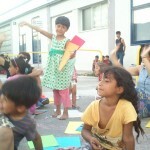 There was good connection between all the group’s (w2eu, JOG and cristian peacemakers —)and the refugee’s and specially the children. Together with them we played, painted and in the night we all dance together. After we had some Music we had an open Mike for everyone to contribute. 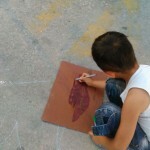 One of the Syrian boy’s, maybe 12 years old, made hip-hop music about his country, his Journey through Turkey and Greece. He also sang also about being a 12 year old boy living with his parents and all the problems, for example putting the stereo too loud or not cleaning his own room. Who are the criminals in Calais? 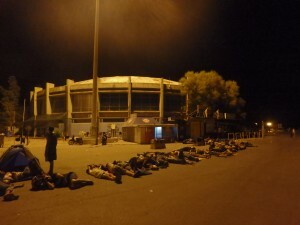 Articel in greek about arivals in Lesvos. Klio and Kaloni. Solidarity groups take care of them. taxis taking 50€ for every distance, hotels refusing them except if they pay triple the price. Vandaag heeft een groep sympathisanten van vluchtelingencollectief We Are Here een voormalig kunstacademiegebouw aan de Dapperstraat in Amsterdam-Oost bezet. Zij hebben We Are Here uitgenodigd om het pand in gebruik te nemen als noodopvang zodat zij hun strijd voor sociale en politieke rechten voort kunnen zetten. We Are Here is een collectief van vluchtelingen in limbo wiens verzoek om asiel in Nederland is afgewezen maar die niet kunnen terugkeren naar hun land van herkomst. Al drie jaar protesteert We Are Here tegen de onmenselijke situatie waarin zij verkeren en roepen zij op tot erkenning van de rechten van vluchtelingen in limbo. Sinds april verbleef de groep vluchtelingen in de ‘Vluchttoren’ aan de Van Sande Bakhuijzenstraat 2 in Amsterdam Nieuw-West. De rechter bepaalde voor de zomer dat de groep eind augustus het pand zou moeten verlaten. Naar aanleiding van deze uitspraak en om de afspraken met de eigenaar van het pand te respecteren verlaat de groep het gebouw vrijwillig. i dont now how to start but i will try, when i arrived in Mitilini the first time to support the refugees and migrants it just felt like i saw my self 6 years ago when i was a migrants myself and left my home,family and friends for a good future. it was so heart breaking to see people in that situation and i could not help them as much as i want because i know the feeling of being in that situation and feeling helpless and the only thing you want is peace and having a chance for a good future and make your family proud of you. Today I am happy that i left everything and went to Europe because it was a dream for some years ago. Now i am here at the same place, supporting the people who are fleeing from war and wanting the same thing that i wanted some years ago. The most important Moment for me in this journey was when I saw the Situation of the refugees at the port. Especially the sick children eating only bread at the port. 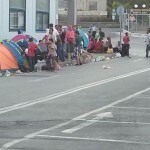 please take refugees in your cars to bring them to the registrazion point in the PORT. It is now by law aloud ! You have to call the number “100” to register with the police that you are about to transport new arrived refugees to the port!!!! And dont forget to have always small water bottels in your car. Welcome to europe and youth without borders. The other day I went inside a Kiosk in the Port of Mytilini, Lesvos to buy some stuff. A men asked what i want here, why i am here, where I come from and then he requested my passport. He spoke English and Greek with me so I couldn’t really understand him. He was very aggressive and didn’t speak friendly to me at all. He laughed about me and through me out of the shop.I didn’t understood who he is and what he want from me. There are so many babies and children on there way to a better future too!! pictures we could see escape and the wish for a calm life, with the hope of a fast arriving. For sure we will see each user again and hopefully in a better situation. This people mostly Syrians and Afghans need human treatment and protection. The European Union has to react and send immediately the needed help . them at their central european countries? till the Macedonian border it turned and goes to Pireus? union is so strong to turn big boats? who have the right to move wherever and whenever they want! And for those who are interested the lyrics you find them here. Wow i don’t know how to explain about that night? 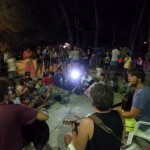 It was a Great memory for the night that I got to know new comers refugees in mytilini! It was great for me because I was waiting and looking for the refugees boats already 3 nights . It was 3:40 am in the morning that I heard some engine sound from the sea. I saw a boat and it was coming to the beach. I listen to their language and realized they were talking in Arabic . I became sure that they are new refugees and I turned on my light and ran down the hill towards them. Unfortunately they were scared of me and they turned back towards the sea . And in that moment a friend of the camp came and shouted towards the refugees: “assalamualeikum! Assalamualeikum!” Then they finally decided to come to us. I was helping them with my other friends out of the water. We gave them table water to drink and started to help . The people face unbearable conditions here: families even with young children and babies have to sleep outside on the ground in the overcrowded camps and in the harbor, without a tent, without a blanket, often even without anything under them. Some of them lost everything on the boat: Today we met a woman, traveling alone with her three small children. She not only lost her passport, her money, everything on the boat between Turkey and Lesvos. We managed to buy some baby food and pampers, we could offer shoes for the children from our donations. But she is just one of so many people here on the island. Around 80.000 refugees arrived in 2015 on Lesvos. The island as a whole has 86.000 inhabitants. Who goes today in the harbor? Who’s heading for Kara Tepe? And who to Moria? These are the finishing questions of our daily plenary. After “using” the midday heat in the shade sitting to reflect on the yesterday, and to plan the today, we head to these the three places – equipped with many info flyers, water, often also medicine, clothing and paper and pens.